Having a clean floor is very necessary in my home. I am a stickler for floor hygiene in my home! It became even more important for me to keep the floor doubly clean after welcoming a dog into the family. 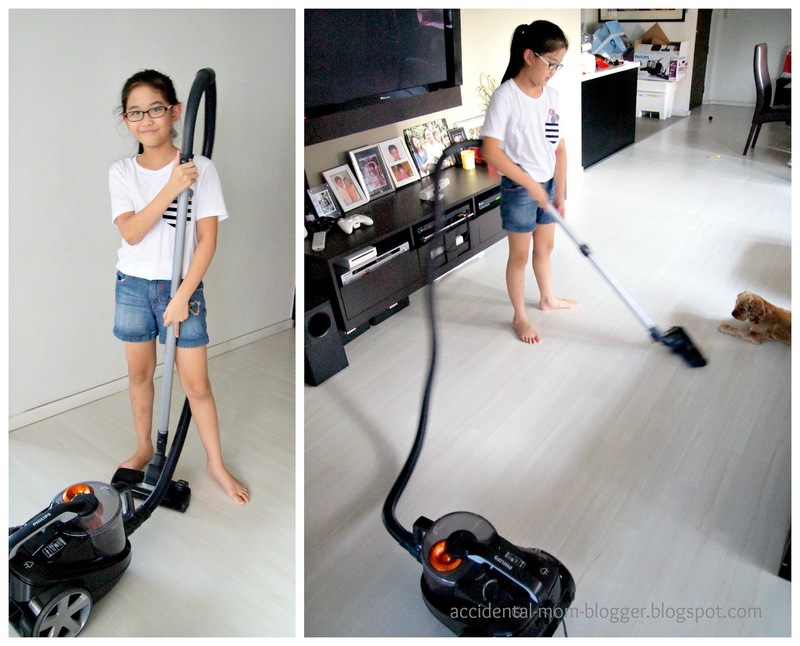 Thus, when I acquired Philip's PowerPro bagless vacuum cleaner recently, I couldn't be happier! 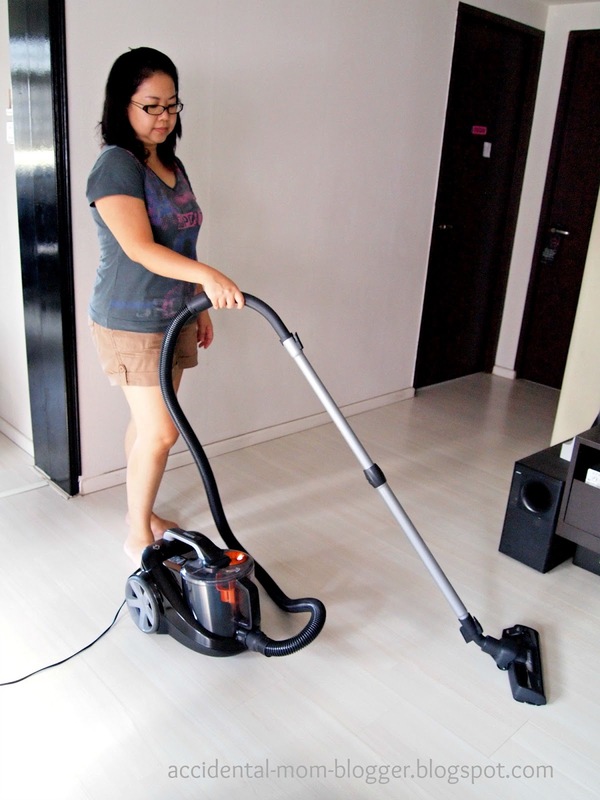 With it's powerful 2100W motor, it does make vacuuming the floor much more effortless as compared to the older model vacuum cleaner that I have. It's AeroSeal nozzle works like a charm and captures more dust (and needless to say, the countless human and dog hair) which is very visible on my beech white laminated floor. 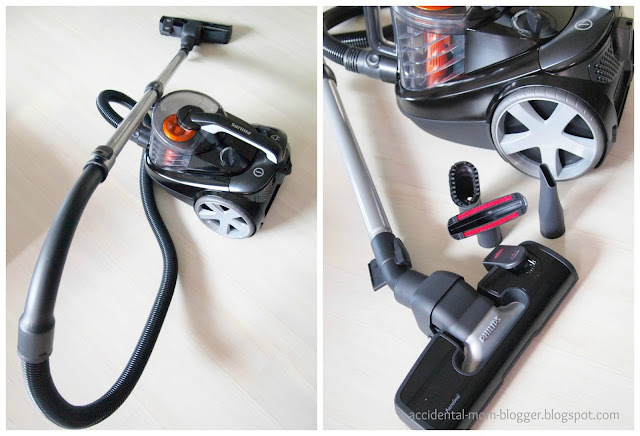 Picture on the right shows 3 interchangeable parts to for different the needs when vacuuming. I think of all the features of this vacuum cleaner, apart from the powerful suction, I am most pleased with the convenience of it's super long 11m radius that helps me reach a wider area in my home at one go. From one power point, I could reach about 80% of my floor area! This was certainly not something I could do with my previous vacuum cleaner which made vacuuming a chore. So this definitely helps me accomplish more in a shorter period of time. I find that it is quite easy to handle and didn't feel it is as cumbersome as those I've experienced using before. My daughter, Megan, also wanted to get into the action! She found it a breeze to handle this vacuum cleaner and had no problem helping me clean up the rest of the home which is a bonus! And just to show you the height of the handle bar, it is as tall as she. Megan is almost 1.4m in height. So you can clearly see where the advantage of this product is giving me. 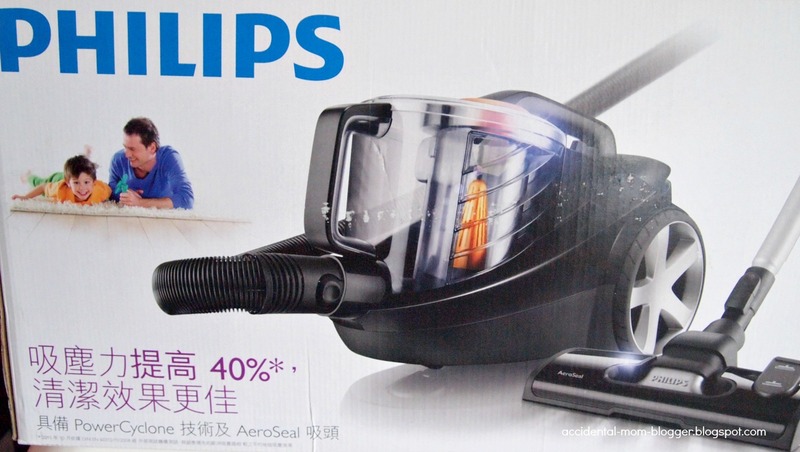 Overall, I think my experience with using it so far has been a positive one and if you're considering replacing your old vacuum cleaner, this would clearly be the choice! 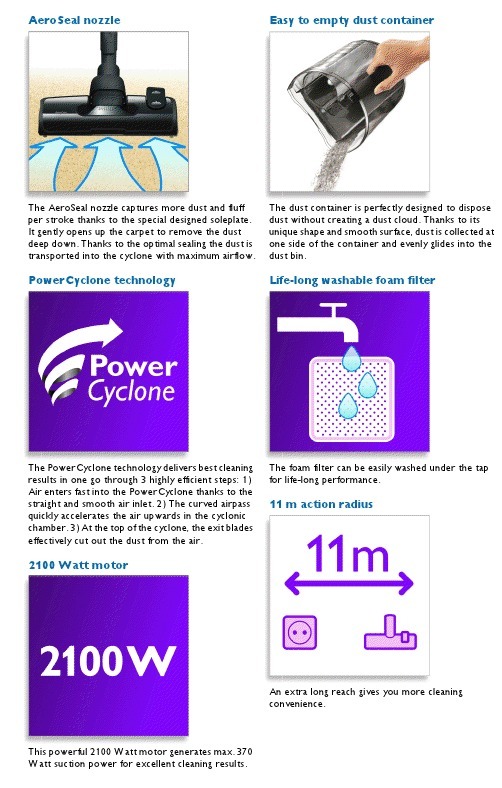 Philips is currently having a Great Singapore Sale promotion on some of their products. You can also stand a chance to win shopping vouchers when you purchase Philips products during the GSS period with a minimum spending of S$200! Do follow Philips Twitter page at https://twitter.com/PhilipsSG and participate in the Twitter games to win up to $100 shopping vouchers! Disclaimer : The Accidental Mom Blogger received the product from Philips.com for review purpose only. I am in no way affiliated to this company and the opinions about this product are purely my own.